Occupations in the construction industry have long suffered from untrue stereotyping and negative assumptions, often made by those with no actual industry experience. Unfortunately, these myths and misconceptions, as well as the push away from trade and technical programs over the past few decades, has resulted in a lot of construction jobs going unfilled. 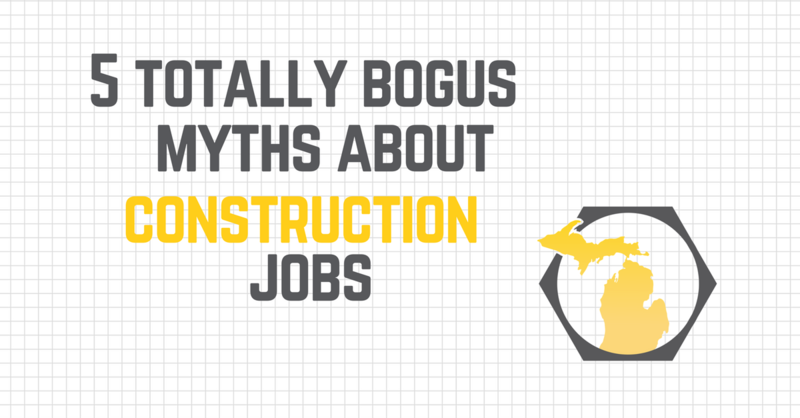 But Michigan Construction wants to set the record straight by debunking five common myths about construction jobs. Myth #1 Construction work is for dummies. Construction is a highly technical industry that requires intelligent workers educated through apprenticeships, vocational/technical programs, or on-the-job training programs that concentrate on the skills needed to do the job. That said, there are also plenty of construction careers, like the engineering disciplines, that do require a four-year college degree. And right now, our state and our nation need all types and experience levels of construction workers to fill positions that pay very well, offer job security and provide a life-long satisfying career. Myth #2 Construction work isn’t fun or interesting. It is entirely true that for some people, construction work would not be a good fit. It is equally true that for others, working all day at a desk in a sea of cubicles would not be fulfilling, or even desirable. It is this second group that is best suited to consider a construction career and the one most likely to appreciate the different types of jobs available from heavy equipment operator to design engineer to ironworker. These jobs can take you away from a desk, often into the outdoors, they require high levels of responsibility and dedication, and fill you with pride when a project is complete. Construction work is hard work, but according to a 2015 report, construction workers are among the happiest, sharing the top spot with facility workers. Myth #3 Construction industry jobs are dangerous. According to the U.S. Department of Labor’s Bureau of Labor Statistics (BLS), in 2016, logging, fishing and aircraft-related workers ranked first, second and third for on-the-job fatal injuries, with roofing coming in fourth. However, construction is one of a few industries with safety and health regulations written to address known hazards specific to construction activities. Reputable construction firms take worker safety and health very seriously, providing ongoing training and the personal protective equipment necessary to conduct work safely. Workers are always expected to report unsafe conditions and management is required by law to ensure a safe workplace. Myth #4 There is little demand for construction workers. Michigan, and the entire U.S. is currently experiencing a severe shortage of construction workers to fill a broad range of jobs. To better define the need for construction workers here in Michigan, in 2017, we published the comprehensive report, “Michigan’s Construction Industry: By The Numbers.” The report looks at the construction industry’s history, what brought on the worker shortage, and what needs to be done to bring the industry back to full force. In short, “Michigan needs to attract 90,000, people a year to fill forecasted openings.” For more information, read our blog about the report. Myth #5 Construction work does not pay as well as a desk job. While it’s hard to compare job for job due to the variety of positions and pay, according to the BLS, U.S. construction laborers earned a mean hourly wage of $18.22, with wages ranging from $10.34 to $30.09 per hour. Based on that information, annual wages range from $21,510 to $62,600. In Michigan, the annual mean wage in 2016 was $38,080. Those stats just scratch the surface, as wages increase for trained and skilled workers, engineers, architects, many in the construction industry earn six figure salaries. Again, construction isn’t for everyone. It is a challenging line of work but one that can provide a stable, well-paying and rewarding career for those with drive and determination. It is also an industry that welcomes women, despite it’s rough and tumble reputation. Anyone who enjoys working with their brain and their hands is urged to take a look at the possibilities in construction today. You might just find your dream career! For more information, contact Michigan Construction today.